The Ekeko will be the central character in the inauguration of the Alasita 2019. 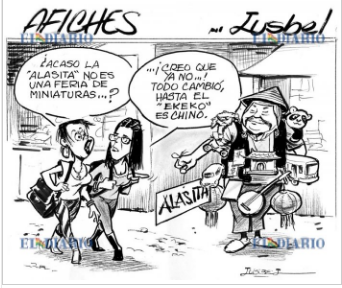 Today [01/24/2019] the traditional fair of Alasita 2019 is inaugurated, a celebration of the miniature that will be attended by the citizenship, the municipal, departmental and national authorities, leaving “to fly their imagination to the country of illusions”. Around 5,000 merchants are already installed in the fairground of the Bicentennial for the inauguration of this event at noon today, Thursday 24, which will run until the second week of February. Also, more than 150 municipal officials, including inspectors, administrative and municipal guards will carry out checks on the sale of little bills and food at the opening of Alasita 2019. The municipal intendant, Velma Vargas, reported that the first days of this fair all the staff of this town council, which are more than 60, will be deployed. After that only the inspectors will work with the support of the Municipal Guard. So … it is up to us, clients, who decide what to buy, in this case, we should ALL buy only miniature crafts made for Alasitas, nothing else if we are to preserve this wonderful fair! 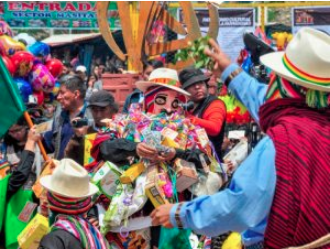 This entry was posted in Bolivia, Business, La Paz, Tourism and tagged Alasitas Fair, Bolivian heritage, national heritage, tradition. Bookmark the permalink.